Over the weekend a group of Democrat haters accosted a group of Christian teens wearing MAGA caps. 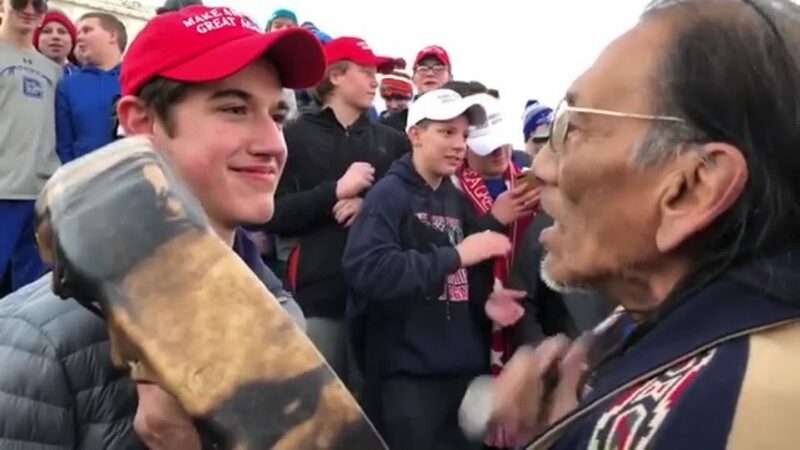 The leftist media portrayed it as the opposite saying that the teens were racists mocking Native Americans. The teens are now the targets of death threats by Democrats and their school is closed because of threats to bomb it or have a mass shooting. This is how the left creates fake news, deludes their hate-filled, mindless followers to incite violence while claiming to be the victims. This is leftist hate amid Democrat fake news and they will not openly retract their lies. When you see Republicans do you imagine you’re seeing Nazis? Do you believe that standing against Republicans is standing against racism? Google actually included Nazism as part of the description to define Republicans as Nazis. This is not reality. This is Democrat mind-control. It is not Republicans who are racist Nazis, but Democrats. It is not Republicans who are violent haters, but Democrats. Democrats that want to take law-abiding American citizen’s guns away to leave them defenseless, scorn Christians, harass conservatives, threaten to shoot or bomb Republicans, or that cheer for criminals to murder cops, are the home-grown commie terrorists your parents warned you about. This is how the left has always operated. They create fake news, disseminate to people who don’t think before they act and incite their dupes to violence against the righteous. This is why President Trump is righteous in declaring that “Fake news is the enemy of the people.” Liberal fascists are the ideological Nazis in America pushing their socialist values through lies and hate. Giving them any credence before learning facts is how people succumb to the fake news of the Democrat media. The only result of believing anything on CNN, MSNBC, or any Democrat network before verifying their “facts” is that the truth is pushed down. This is why you can never appease evil, never work with evil, and must never retreat from evil. You must stand and defeat it!